The panel gives clear notifications that indicate system status, zone descriptions, alarms, and emergencies. One touch access allows the quickest help possible in an emergency. The panel’s LED buttons indicate the system’s status. 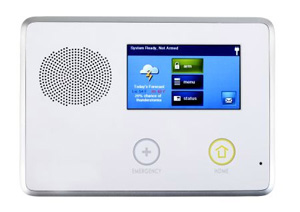 The easy-to-use color touch screen puts a wide range of security and home automation controls at your fingertips. Secure your home by arming your system "AWAY" or "STAY." The Quick Arm/Exit and Bypass features offer added convenience. The panel’s built in Z-Wave radio enables various home automation functions including HVAC, appliances, and lighting control. Always be in control by remotely managing your system from a computer or web-enabled mobile phone (Blackberry, iPhone, and Droid). The fully self contained panel contains a snap-in GSM Radio, a 24-hr. backup battery, and allows 32 user codes to monitor up to 48 wireless zones and 2 hardwire zones. Introductory Price: $39.95 per month. $34.95 per month with no Interactive Services. Includes full remote alarm access of lamps, appliances and thermostat controls.